Lorna: [after hearing a rapid knock at the door] It's the Law, Charlie! Charlie Croker: What you tell 'em? Lorna: Charlie, would I tell them anything? Charlie Croker: ...Yes you would. Q: How could they have solved the problem at the end? Q: Was there a sequel planned? "It is a work of genius." 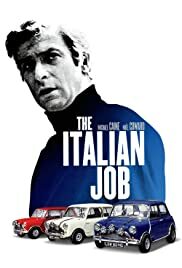 In a sense I was disappointed to find that I actually liked The Italian Job. For after decades of imitations and student new-lad pub bores crowbarring "You're only supposed to blow the bloody doors off!" into conversation, I was all prepared to hate it. Yet The Italian Job is a good film. A very good film in fact. First-class direction, all pans and upshot angles, and slyly political, though its "Cool Britannia" ethos almost seems to parody devotees of the Union Jack. Anyone watching this film for reconfirmation of the Empire is mistaken, though the team's final downfall notably comes from the only non-Caucasian member. The humour is self-conscious, but never so that it goes too far; it's always witty. Michael Caine is the archetype Michael Caine, all pointing finger and raised-voice declarations, the version mimics love to portray. Noël Coward is able support in a straightish role, though the wonderful Benny Hill parodies his own image, thus diluting his already fine (And misunderstood) ironic take on the sexual pervert. Screen realism is not an issue here, with a Mafia cameo who are hardly Don Corleone. Women are also marginalised, with only Maggie Blye getting a largish role as Caine's girlfriend, Lorna. This is the same girlfriend who hires six women to help celebrate his release from prison, and refers to fellow womankind as "birds". Yet while the film is a "boys only" club, it's far from a testosterone-led car chase, as Coward's appearance should attest. And what makes the final climatic chase so rewarding is that it's carefully, and intelligently, set up. The film is metaphorical where you wouldn't expect it to be, and well-acted all round.